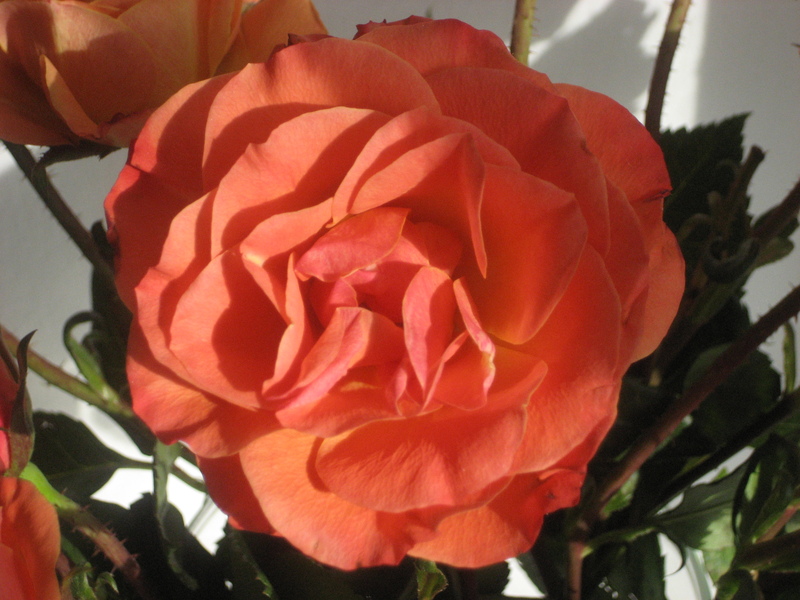 Can roses cause the winter blues? It will be 35 degrees today. Balmy compared to the last two days – maybe we should break out the t-shirts and shorts. The sun is shining. At least we’ve got that going for us. Days are getting infinitesimally longer since the sun made its turn at the solstice and I no longer desire to sit by my fire and look at the Christmas tree and read tales of idyllic English villages covered in blankets of snow. I wish I were still content to do that; I would be much happier. I enjoyed December. I enjoyed the rest, the coziness, the dark evenings that forced us all inside to string popcorn and to watch Jimmy Stewart realize his worth. Now all of a sudden, I’m restless. I’m buying orchids. I’m kicking the snow off my garden to see if I could possibly dig. I’m visiting the local nursery just to stand in their greenhouse and pretend I’m actually warm. I want spring. Maybe it is the turning of the sun that winds me up again. Slight changes in the amount of light received can cause poinsettias to turn red or Christmas cactuses to bloom; could those few extra minutes of daytime ignite my overwhelming, almost physical need to see things bloom? Here’s the problem, though: Nothing blooms in January in southeastern Pennsylvania, and nothing will bloom for weeks and weeks and weeks. C’mon, Kelly, you say. Buy some tropical house plants, enjoy some central American flowers in a vase. Certainly those could help take the edge off? Somehow, they seem only to make things worse. I made the mistake of buying myself a few sprigs of salmon colored roses the other day. They’re lovely, no doubt about it. Sitting on my kitchen counter, all cheerful and flouncey, they do make me smile. That is until my gaze wanders to the view out my window. Gray trees growing next to stone houses sitting under a steely sky look even more gray compared to those little show-offs. Thus, the winter blues begin. I’m not much for New Year’s resolutions, but I just might need some resolve in this case. So instead of moping around and feeling sorry for myself and counting down the days until the Philadelphia Flower Show opens (48), I resolve to be a bit more constructive about my self-diagnosed seasonal affective disorder. (My husband Eric will certainly cheer this news. By the end of February every year, he’s ready to cash in the 401K and seek out serious professional help for his sad, sad wife). I will seek out a remedy. I will read great books about the earth blooming. I will try to appreciate one thing about creation every day – even if it is neither bloom nor bud. I will look for beauty and take pictures even if I have to trespass. I will write down my plans for the growing season instead of letting them fester in my depressed head. I will look for a job in a nursery. I will take a class on turning my tiny yard into a wildlife habitat. I will wear brighter colors. I will ….well, we will see, won’t we?